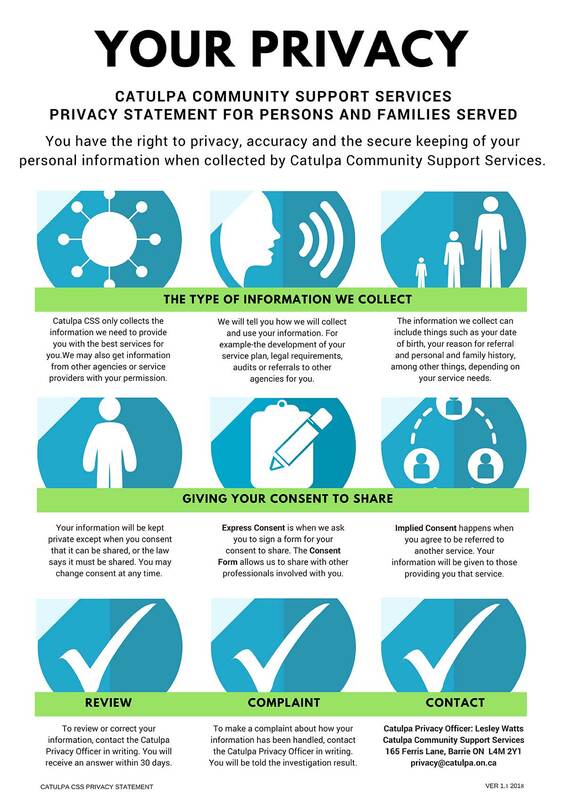 Catulpa Community Support Services recognizes the right to privacy, accuracy and the security of personal health information collected from the people it serves, or from those acting on their behalf. Our privacy practices are based on the Canadian Standards Association Model Code for the Protection of Personal Information and the Personal Health Information Protection Act(PHIPA), the standard by which personal and health information is protected. Information about your/family health history. A client is a significant danger to themselves or others. In most cases, we directly ask you for your consent for the collection, use and sharing of your personal information.. This is called Express Consent. By signing a Consent Form, you give Catulpa written consent to share information with another professional. Verbal consent may be asked for if it is not possible to obtain a signed consent form. Your response will be noted in your file. This is also expressed consent. Unless you tell us otherwise, it is assumed when you receive service from one of our programs, that you agree with the sharing of information with Catulpa Community Support Services employees who require the information, as well as consultants involved in providing services to you and your family. This is called implied consent. This may occur without directly asking you for your consent or requiring you to sign a consent form. Catulpa protects your personal health information, both in written and electronic form, from theft and loss and unauthorized access, copying, modification, use, disclosure and disposal. Catulpa retains your personal health information in accordance with legal requirements and for the time required for the purposes identified. Catulpa conducts audits and complete investigations to monitor and manage our compliance with privacy legislation. Catulpa employees, volunteers, consultants and students are bound by our Oath of Confidentiality and polices and procedures for the safeguarding of personal information. Basic client information, such as name, date of birth, reason for referral, and types of service are retained in our electronic client information system. Your written file is stored for 10 years following the date of discharge. Adult files are shredded at that time and child/youth files are stored for 10 years following the individual’s 18th birthday, when they are also shredded. There are some exceptions to this rule which will be explained to you if relevant. To make an inquiry or complaint about how your personal information has been handled, please send a written request to the Catulpa Privacy Officer listed below. Your request should include a consent to use your personal information for an investigation into your inquiry or complaint. The Privacy Officer will investigate your inquiry or complaint and take appropriate action if required. You will be notified of the investigation outcome and any actions taken with 30 days, or the Privacy Officer will inform you in writing of the need for an extension. To access your written file, please send a written request to the Catulpa Privacy Officer listed below. Upon request, Catulpa will provide you access within 30 days, or the Privacy Officer will inform you in writing of the need for an extension. To correct personal information within your written file, please send a written request to one of the Catulpa Privacy Officers listed below, along with a written update or correction of your information. The information will be amended as required within 30 days, or the Privacy Officer will inform you in writing of the need for an extension.